If you are an NPR fan, the NPR One app is a must have. With simple controls, an equally simple but elegant user interface and a near perfect search functionality, this app will allow you to get your fill of NPR content on any device that is network connected. One of the new apps in the Windows and Windows Phone Stores that is a real bright spot is the NPR One app. National Public Radio, or NPR, released the app last week for Windows 8.1 and Windows Phone 8.1 to bring you news and information from your local NPR station as well as news and information from the wide range of NPR shows to your devices, completely free. With smooth navigation and powerful search functionality, the NPR One app is a must have for those who listen avidly to National Public Radio. The release of NPR One last week covered both Windows 8.1 and Windows Phone 8.1 to the closest thing that the platforms today have to Universal Apps. Functionally they are identical with only modifications for the UIs coming into play. to as well as play or pause the audio stream. You can also forward to the next story by pressing the Fast Forward button. These simple controls are one of the beauties of the NPR One app. It is not overly complicated and that certainly has appeal for many. Navigation in the app is equally simple and straightforward. By swiping left you can see a history of articles you have listened to on any of your devices. The app synchronizes between Windows 8.1 and Windows Phone 8.1 thanks to leveraging your NPR or Microsoft account. Likewise, swiping right on either your Windows 8.1 PC or Tablet as well as your Windows Phone, you can see articles that are available for listening. good with results returned quite fast on either platform. Some of this is largely dependent on your Internet connection speed I realize but the fact it the search function begins searching as you type so it speeds things up nicely. While the navigation and search functions in NPR One are great, what I think makes this app so nice for NPR listeners is that you are in control of what you listen to in the app. With the search function and the swipe navigation between articles, you can decide what you want to listen to without having to wade through a stream of content that you aren’t necessarily interested in listening too. 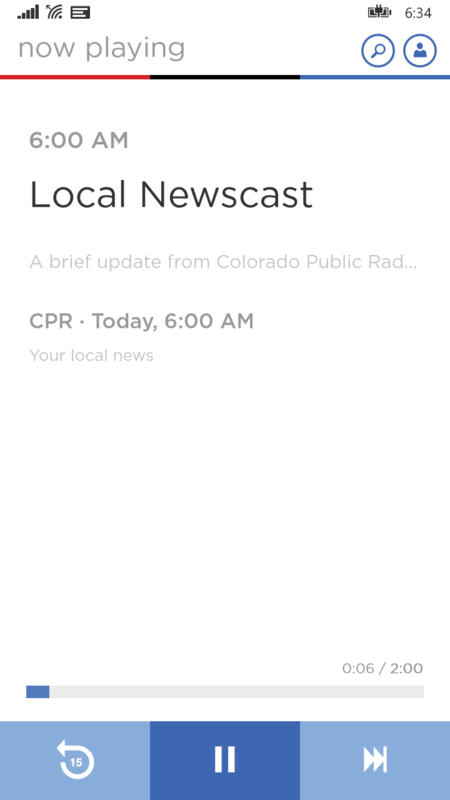 NPR describes it as “public radio made personal” and I think they have hit it square with this app. 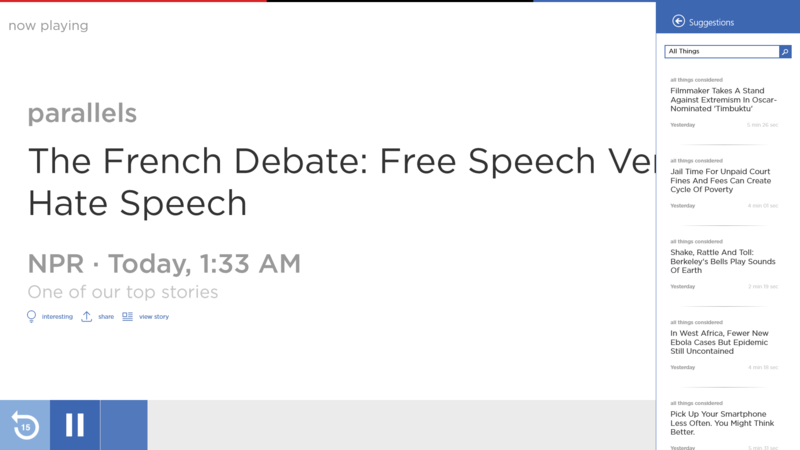 Finally, the NPR One app is very much socially aware. You can share articles you find interesting on a variety of Social Networks including Facebook, Twitter and of course email. You can also mark articles as Interesting so you can easily find them again if you want to listen to them once more. Overall I have found the NPR One app to be a great app with solid performance and a super easy to use user experience. NPR clearly put a lot of thought into the app and it shows in its simple but elegant design. My only wish is that the app would allow for downloads to my devices. As one who travels a lot, I would enjoy listening to content while I’m in Airplane Mode on a plane. I appreciate that’s the purpose of podcasts (which NPR has plenty) but having it all in one app would be great. NPR One for Windows 8.1 and Windows Phone 8.1 is free and available now in the respective Windows App Stores.